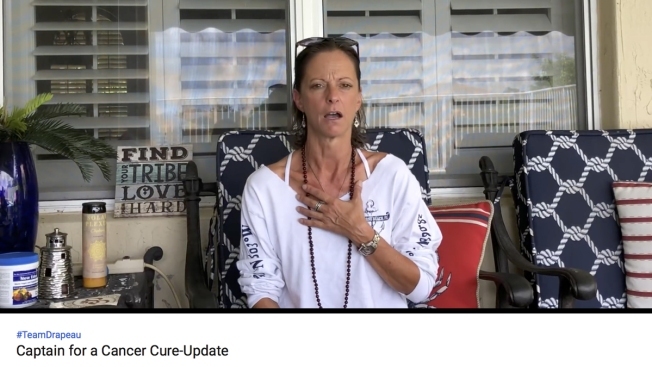 In this image from video posted on YouTube on Aug. 11, 2018, Michelle Drapeau, a stomach cancer patient in West Palm Beach, Fla., speaks about her condition. Drapeau set up a GoFundMe account to help pay for her medical expenses. Drapeau has raised about $7,000 for homeopathy and other alternative remedies since being diagnosed with advanced stomach cancer in February 2017. "I wanted to make sure I explored every and all options," Drapeau said. "It's vital for everyone to have that opportunity." Soliciting money on GoFundMe and other sites eliminates doctors, hospitals, insurance companies and other "gatekeepers" that can be a barrier to expensive treatment, said lead author Dr. Ford Vox, an ethicist and brain injury expert at Shepherd Center rehabilitation hospital in Atlanta. He calls it "the democratization of economic power through social media" but says it can pose an ethical dilemma. Online fundraising "has a big bright side" when it helps patients pay for legitimate care, he said. "Communities are really being able to rally around people in rough times. That's fantastic, but there is this very clear dark side" when treatments sought are worthless or even dangerous. "We always encourage people to fully research whatever it is they are raising money for and to be absolutely transparent on their GoFundMe page, so donors can make an informed decision on what they're donating to," GoFundMe said in an emailed statement. While some patients swear they've benefited from some of the treatments, there is no rigorous scientific evidence that any of them work for the conditions involved, the researchers said. "I wanted to make sure I explored every and all options," Drapeau said. "It's vital for everyone to have that opportunity." Dr. Leonard Lichtenfeld, the American Cancer Society's deputy chief medical officer, said it's important to consider what may drive some patients to turn to unproven remedies. U.S. health care costs are exorbitant and many patients run out of money trying to pay them. And despite considerable progress against cancer and other illnesses, conventional treatment can't cure every patient, he noted. "We should not be judgmental and come out and say this is terrible," Lichtenfeld said. "No one wants to hear, 'You have cancer,' and especially no one wants to hear that there's no treatment available that can help you," he said. "You begin to understand why people may turn to unproven treatments and you can understand why others reach out to try to support them." "What we need to do is to better inform, even better care for our patients and their families, so they don't feel this is what they need to do."